I'm sorry for my posting last week. When I actually got to post it was a dis-jointed collection of thoughts because I was going in 100 different directions. But the week came to a head on Friday afternoon. 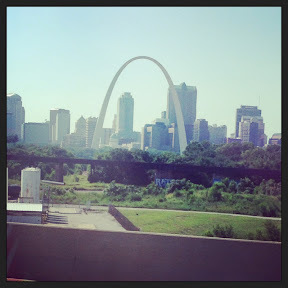 I was so excited to take a short trip (one day) to St. Louis to see my friend. She is getting married soooo soon and we had a bridal shower to take care of! I was so excited to get to see her and get this wedding thing kicked off in my brain. Pretty much up to now I just knew they were getting married but I got to meet the future husband and in less than 3 months they will be getting married!! 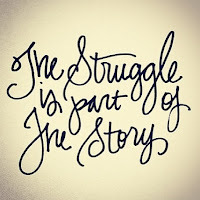 But today it was back to the grind. Last week my food was ok, not good not bad, my workouts were ok, not great but could have been better, and my motivation was slacking. I know its only Monday but this week is already looking better. I ate my food that I packed without cheating, and got a good workout. This mornings workout could have been better but I was exhausted. I didn't sleep well last night, I saw almost ever hour. I traveled all weekend which was draining and I didn't workout after Thursday so I wasn't exhausted so my sleep suffered. And the 4 hour nap on Sunday, that never helps but I was exhausted on Sunday afternoon. Ha, I needed the sleep. Even though I wasn't feeling it this morning I got up and did my Pump class and then got in a 20 minute run and finished off with 5 miles on the stationary bike. I have really been missing my bike but it hasn't stopped raining long enough for me to get a ride in. I have to ride the bike until I can get outside again. I got to work a little earlier than normal and started pounding the coffee cause I was still tired after my workout, I am usually Johnny Chipperpants after my workout but I'm telling you I was whipped today. 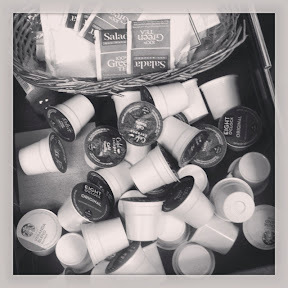 I visited my coffee drawer several times today. Its not a problem, but it is funny when you see it! After a few hours (and a few cups of coffee) I was finally up and ready for the day, it just took me a minute to get there. I did great with my food today, it started with 2 eggs and 2 egg whites and some toast. Instead of trying to up the protein, which was a disaster last month, I am eating a heavier meal in the mornings and tapering off as the day goes on. Now Im just trying to lose the weight I gained while trying to up my protein! 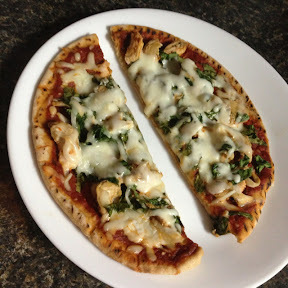 Lunch was a grilled chicken pita pizza w/ spinach! Delicious!!! I got a unconventional evening workout. I mowed my yard. It was embarrassing, some parts were 2 feet high. I already said it has rained for weeks and I havent been able to mow. I mowed this afternoon and had a good sweat going on, that was until it started raining again. I finished up the yard in the rain....it wasnt going one more second without getting mowed. I actually got all my yard stuff and errands done before 8pm, and then got all my food and clothes packed up and I knew EARLY BEDTIME tonight!!!! Now to keep from ruining it I am actually going to stop posting and hit the bed! Have a good night! !